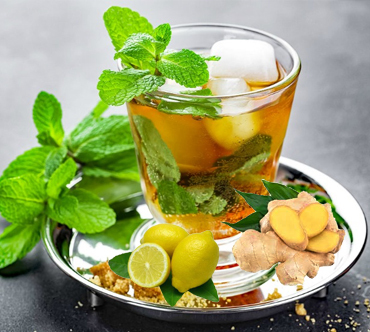 Ginger, mint & lemon green tea While fresh lemon juice has anti-inflammatory and antioxidant benefits besides a load of vitamin C, ginger and mint are excellent for digestion. Together, all the ingredients make the green tea concoction, liquid gold, when it comes to delivering health benefits to your body. Ginger contains Gingerol, a substance with powerful medicinal properties and has powerful anti-inflammatory as well as antioxidant effects. It acts as a wonderful immune system booster. Peppermint on the other hand soothes headache, aids in digestion and reduces nausea, while lemon, a good source of vitamin C helps in improving the strength of your immune system. © 2018. Indian Brew. All rights reserved.